Last Sunday, I scored an opportunity to hang out with my brother, which means that we spent a lot of time listening to records and talking music. I had a list going of all these records I wanted to play for him, which were too numerous to remember so any moment I thought of something he HAD to hear, I would turn off whatever the stereo was blasting in exchange for whatever I had in mind. I was expressing the sort of erratic and misplaced energy reserved for A.D.D.-fueled channel surfers. At some point during this wave of excited “show n’ tell,” I threw on Grindstone, the latest offering by Norway-bred progressive quartet Shining, and watched his face sort of bend and twist into a series of facial expressions as he seriously considered what he was hearing. “This album is like a film score,” I told him, “for an old science fiction movie. It’s like how the future sounded 20 years ago.” He sort of liked that description, especially once he heard the boldly synthesized voice and the fuzz-toned bass-lines of “Asa Nisi Masa,” which plays like Blade Runner meets War Games. Not to say that Shining sounds antiquated. They add a refreshing dose of innovation to the otherwise played sci-fi, robo motif and approach the rest of Grindstone with remarkable attention to intensity, instrumentation and experimentation. 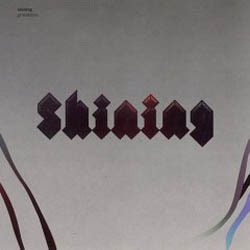 With every track, Shining throws curveballs, displaying a strong willingness to remain uncategorized or, maybe to an extent, not completely understood. That being said, Grindstone is initially difficult to figure out, but once you get it, you can’t help but appreciate it. To reiterate though, listening to Grindstone is like sampling a beautifully and wildly conceived film score. It’s opener, “In The Kingdom Of Kitsch You Will Be A Monster,” (also the name of an earlier album), being one of the few tracks with vocals, works perfectly as an intro, oozing an Ozzy-inspired howl over syncopated beats, eerie acoustic guitar strings and woodwind whistling. It’s a hard track, throwing out time signatures that never seem out-of-place. It just works. Keeping up the intensity, the sound-storm dubbed “Winterreise,” plays some Mars Volta-inspired percussion, but offers up some powerful choral singing amidst the fury. Then, things get weird. “Stalemate Longan Runner” begins with a fractured idea of its rhythm and then works its way into high-speed rock power only to abruptly end with dinner party harpsichord. The conservative keys fade into chimes for “To Be Proud Of Crystal Colors Is To Live Again” and “Moonchild Mindgames” almost plays like a waltz number with blobs of bottom end synthesizer obscuring the distant piano and whistling saw-whine. “The Red Room” revisits the fractured rhythms of “Stalemate,” compounding that with Albert Ayler-styled sax playing and then powers into a freeform bass/drum frenzy. The aforementioned “Asa Nisi Masa” follows that up with offbeat electricity and robotic vocals. “To Be Proud Of Colors Is To Live Again” reprises before “Psalm,” a close-to orchestral and angelic piece of music, confirms that Shining live to create intensity in any form. “Psalm” is a mid-way mindblower, exploiting studio experimentation while providing a powerful background for singer, Åshild Skiri Refsdal. “-… .- - .-. …” acts as an interlude before “1:4:9”’s guitar noise and diabolical orchestration suggests the “moment before something horrible” strikes. Refsdal adds her voice here as well. Climaxing our film, “Fight Dusk With Dawn” makes us wonder if it’s a happy ending we’re going to get. Menacing guitar start things off and the song explodes into an intense mass of freeform jazz and progressive metal a la Mr. Bungle. By the time the last bits of noise emerge, the gong of a distant bell, the song has more or less faded into nothing and then the credits roll a cappella. As the music played, my brother at one point sort of shook his head in agreement and said, “I like this.” It seemed understated, but Grindstone is an album that requires consideration before it earns enthralled devotion. It’s a thinking piece that arouses conflicting emotions with every track and implies some kind of a story. It’s difficult to know what kind of story that is, but rest assured that it’s worthwhile.